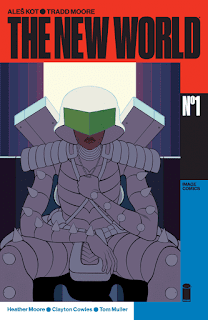 The Fellowship was fortunate enough to obtain a copy of THE NEW WORLD #1 from Image Comics. Ales Kot writes, Tradd Moore draws, Heather Moore colors, and Clayton Cowles letters. Welcome to New California – a place where the cops are TV stars, deadly force is encouraged, and ratings rule! Stella is the number 2 cop on the air, but only because she won’t kill the perps. Stella has a hard time sleeping, so tonight she’s hitting the party circuit, where she hooks up with a beautiful young dude named Kirby (nice guy, if a little anti-establishment). The next day she gets teamed up with the #1 star, and they get assigned to capture a terrorist by the name of, you guessed it, Kirby! There is a ton going on in this super-sized first issue (my summary doesn’t even come close). Kirby is a great character in his own right, and Stella has some interesting connections as well. And the world is fascinating, with some cool future history going on. It’s a lot to process, but so much fun along the way. And the art is very sweet, with a cool futuristic vibe tinted with low-tech stuff, and a bit of ultra-violence in the mix. The hints are that this is a love story of a sort, and they’ve built an amazing setting for it, that’s for sure. Can’t wait to see where we go from here. THE NEW WORLD #1 is available now from your local comic shop, or online at imagecomics.com.